President Edward Sparkman earned a B.A. 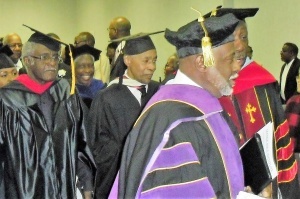 degree from Howard University, a Juris Doctorate from Temple University School of Law, and a Master of Divinity degree from Palmer Theological Seminary. Dr. Sparkman has been a practicing attorney in Philadelphia for forty years, and serves as a national consultant for Neighborhood Works America and National Community Reinvestment Coalition (NCRC) in the area of foreclosure prevention, home preservation, and bankruptcy. He was a former staff attorney at Community Legal Service of Philadelphia, Chief Assistant City Solicitor for the City of Philadelphia, and a Federal Bankruptcy Trustee for the Eastern District of Pennsylvania. 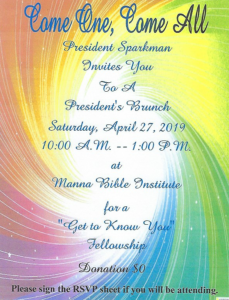 Dr. Sparkman is the Senior Pastor of the historic Shiloh Baptist Church in South Philadelphia, where he has served faithfully for twenty years. He is married to Verona Sparkman, and they are the proud parents of three daughters, Nicole, Karen, and Crystal, and the proud grandparents of five grandchildren. 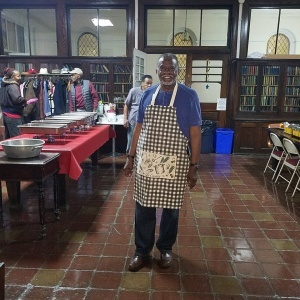 Dr. Sparkman serving up a breakfast for the Men’s Fellowship of Shiloh Baptist Church, where he has served as Pastor for twenty years.